This Cat & Dog handpainted needlepoint design is by the artist Two Dog Dezigns. The design measures 7.5" x 9". It is handpainted onto 13 mesh Zweigart mono needlepoint canvas. There is some shading in this animal handpainted needlepoint design that you can choose to stitch or not. 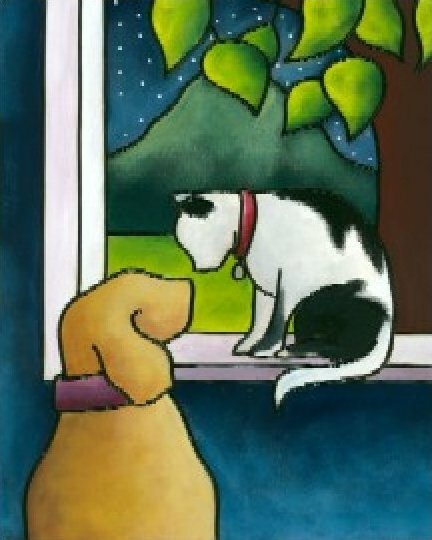 This Cat & Dog handpainted needlepoint design can be purchased canvas-only or as a kit. If you order a kit with wool or silk yarns it will come with Planet Earth boutique fibers. If you order it with cotton fibers it will come with DMC embroidery floss. This Black Lab needlepoint is in stock and ready to ship. Contact us with questions about this animal handpainted needlepoint.